Interesting Facts: Krookodile has a thick maroon-colored body, black back, and white stomach. It has five triangular spikes on its back: four around the middle of its back, and one large one at the beginning of its tail. Each of the smaller spikes on its back are linked to black, triangular spikes that reach around to its front, slightly overlapping its white stomach. The largest spike sits at the beginning of its long thick tail, which has three, thick, black stripes. The last stripe covers the tip of the tail. Its legs are very short and directly attached to its feet. The feet are wrapped in black and have three white claws facing forward. Krookodile's arms are short and thin with a black stripe around the elbow. Its long, thin fingers are each tipped with a white claw. NOTES: Start from the snout, and work your way into the head and down. Attach the arms as soon as possible (as indicated by the numbering). Be careful with the claws, they're the toughest part of the model. Build the body down to the tail. Build the tail back to the tip, and then close at the feet. Yaaaaaaay I was shouting at school because I was so happy!! Amazing craft! one problem, im having trouble on the eyes how they connect to his mouth, but awesome the minute i saw this i was paralyzed! It would have been better if you'd wrote "Each of the smaller spikes on its back are linked to black, triangular stripes..." Still, just phenomenal. Are you going to start posting Gen 6 papercrafts soon? So many of them are awesome! I'm not trying to rush you guys though. 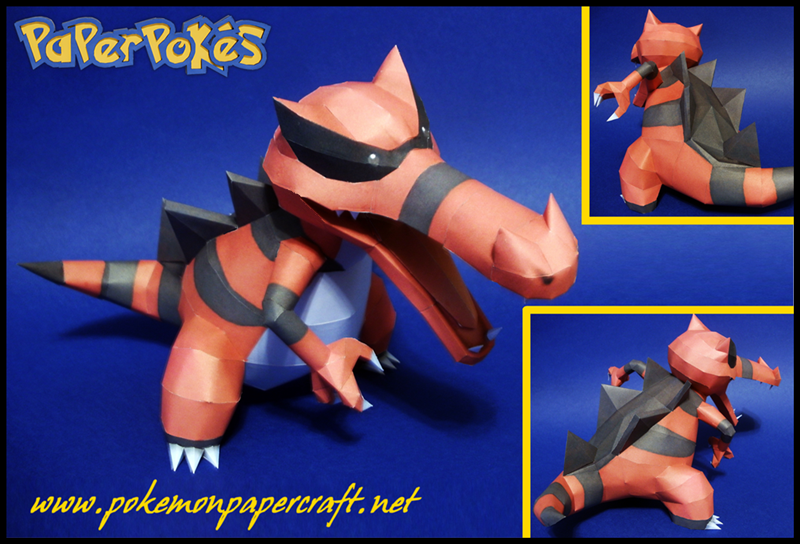 hey, one of my favorites pokemon, it's amazing model i go to build immediately...!!! How exactly do you open up the template? Which program?